snowmen call for your attention. I can't help but start thinking about skiing and snowboarding. 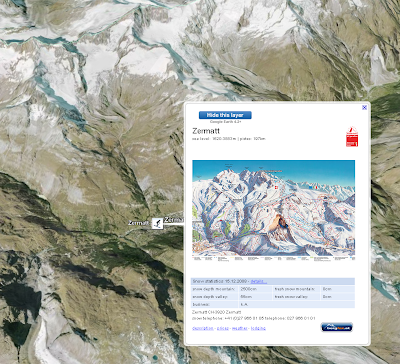 A very easy and visual way of checking the latest snowfalls in ski resorts in the Alp regions of Austria, Germany, Italy, and Switzerland is the new "Ski resorts in the Alps" layer in Google Earth. You can find it in the Gallery folder of the layers panel under "Travel and Tourism". All information on the ski resorts are provided by bergfex who aggregates the data from the ski resorts to make sure that you get the latest data in this layer. The icons represent the average snow depth of that area; the whiter the icon, the more snow you can expect. Check back often, as these snow depth readings are updated four times a day. 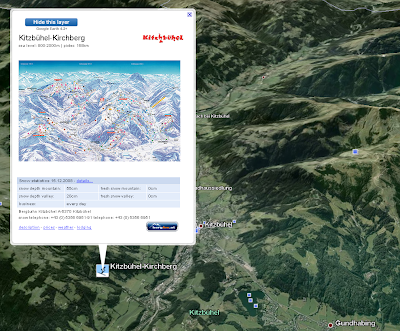 Every balloons displays useful information such as the fresh snow depth from within the last 24 hours (on the mountain and also in the valley), the altitude of the skiing area, the length of the slopes, useful phone numbers, and much more! Now use Google Earth to get the latest info and then get outside to enjoy the snow, the real stuff, on-site! It is undeniable: winter has arrived here in Europe. Piles of snow line the roads, white roofs and snowmen call for your attention. I can't help but start thinking about skiing and snowboarding.